In 1902, George A. Wagman, a hard working young man still in his early 20s, began a small manufacturing business producing concrete sidewalk slabs and ornamental products. As business grew, George faced stiff competition in concrete manufacturing, and began bidding on concrete bridges. George was awarded his first bridge project in 1908 and concentrated his efforts on bridge construction from that point on. George’s brother, Fred, became a partner in the company in 1909, and G.A. & F.M. Wagman was formed. The Wagman brothers built bridges, dams, reservoirs, and roads throughout Pennsylvania, and drove piling for the first time in 1917. George and Fred remained partners until Fred’s death in 1947, at which time George’s son Francis (Bud) Wagman, who had joined the firm in 1935, became a partner. George and son Francis remained partners until 1948, when the partnership was dissolved, and G.A. & F.C. Wagman, Inc. was formed. Following George’s death in 1952, Francis assumed control of the corporation, which grew into a highly rated heavy construction company under his leadership. Throughout the ’50s and ’60s, Wagman built bridges, interchanges, and overpasses throughout Pennsylvania, and into Delaware and Maryland. In 1970, Francis’ son Rich Wagman joined G.A. & F.C. Wagman. The company made its first acquisition to expand services and began constructing water and wastewater treatment plants in 1972. Then, Wagman entered the concrete overlay market in 1974, when Dow Chemical named Wagman one of the two initial Pennsylvania licensees for its latex modified concrete. When Rich Wagman succeeded his father as President in 1977, Wagman had earned a reputation as a growing, heavy civil construction company and a master bridge builder, and was bidding for larger and more challenging projects. Throughout the 1980s, the company successfully expanded into commercial/industrial construction, and real estate development, while maintaining and growing its successful heavy/highway operation. Wagman built their first senior care facility in 1992. A year later, Wagman expanded operations into Lancaster and surrounding counties when it acquired Consolidated Construction, a Lititz general contracting firm. Then, as part of a major company restructuring in 1995, Wagman Construction, Inc. (WCI) was formed to handle all private sector operations. One of Francis’ other sons, Joe, who had been working in that area since 1990, was named President of WCI. During the latter half of the 90s, WCI expanded services to include institutional, medical, office and urban redevelopment projects. 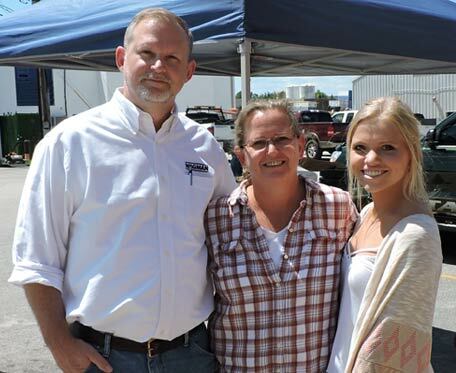 In 2001, Rich’s daughter, Lisa Wagman Glezer, and her husband Mike Glezer, joined as part of the fourth generation at Wagman. In 2002, Wagman celebrated its 100th anniversary. With a vision to be “the premier contractor in the markets we serve,” G.A. & F.C. Wagman, Inc. made a strategic decision to enter the “mega-project” arena. Wagman’s acclaimed role in the Woodrow Wilson Bridge project marked Wagman’s entry into the mega-projects. This decision provided the opportunity for significant growth and investment in the following years as Wagman participated in multiple joint ventures, often in the role of managing partner. The establishments of the Wagman Corporate Community Fund and The Wagman University for Professional Development were two more notable achievements during this time. As growth continued for both companies, in 2009, WCI relocated from the corporate office to the urban redevelopment Codo project in downtown York, for which they were the construction manager. WCI incorporated many green features into the renovated office space which was recognized as the first for-profit LEED® certified office space in York County. Expansion plans continued and in 2012, Wagman acquired a Geotechnical Construction Services company in Virginia to expand services and grow Wagman’s presence in the South. In 2013, Wagman acquired Key Construction Company, Inc. and its subsidiaries, D.W. Lyle Corporation and Key Constructors, Inc., established heavy highway contractors. They now operate under the Wagman name out of an office and yard in North Dinwiddie, VA. In 2015, G.A. & F.C. Wagman, Inc. changed its name to Wagman Heavy Civil, Inc.
Today, Wagman, Inc. serves as the management and holding company of Wagman Heavy Civil, Inc. and Wagman Construction, Inc. Mike Glezer is CEO of each company. Rich Wagman is Chairman of Wagman Heavy Civil, Inc. Joe Wagman is Chairman of Wagman Construction, Inc.
Francis “Bud” Wagman passes the gavel to son, Rich April 2, 1977 naming him President. Back Left Portrait – George A. Wagman (first generation), Back Right Portrait – Francis C. Wagman (second generation). Back row – Rich Wagman & Joe Wagman (third generation), Front Row – Lisa Wagman Glezer & Mike Glezer (fourth generation). Rich Wagman passes the gavel to son-in-law, Mike Glezer on July 10, 2012 naming him CEO of Wagman.